According to my web tracking on this site at least 10% of you are now running IE9 (beta) that has just been released to the web. 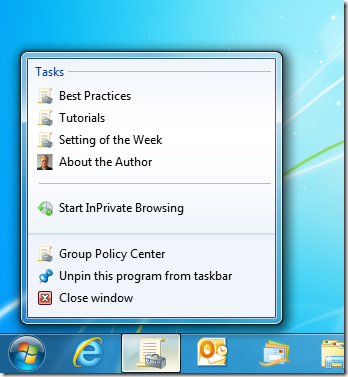 So for all you people on the cutting edge I have just implement some of the cool new Internet Explore 9 features on my web site so that you can pin this site to the task bar in Windows 7 and take advantage of the jump lists. 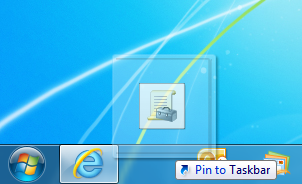 To pin your site to the taskbar simply drag the favicon from IE’s address bar and drop it onto your taskbar (See image below). 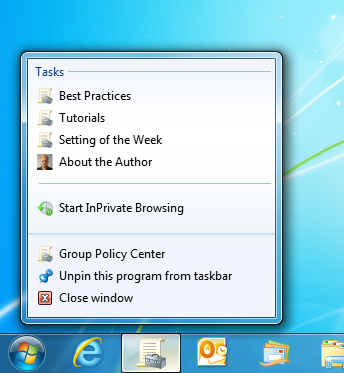 Now all you have to do to visit my site is click on the icon in the taskbar… How easy is that!!! When you launch the site, notice how I have also customised the navigation button colour matched the web site colour. The coolest new feature is the custom jump list tasks that I have configured so you can jump directly to the part of the site you visit the most. 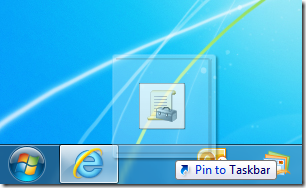 I hope you enjoy these Internet Explorer 9 / Windows 7 integration enhancement and that it makes you experience on this web site all the more easier.